Every once in a while, there's a mani that makes me think: How in the heck did I manage to do that? This week's mani is one of those. Even choosing which photos to share was agony because I can't handle the prettiness! Haha! This gold polish, guys. THIS GOLD POLISH. It has such a soft finish, making the name Rollin' In Cashmere even more appropriate. Be warned, though, that this polish streaks like a motha. After several failed attempts at even coverage with two coats, I learned that the brush needs a good amount of polish on it at all times. No 'finishing' strokes with this one, folks! It'll just create a big polish-less line on your nail. So load up that brush! Because I love this mani so much, I decided to do a photo tutorial (mostly so I could remember how I did it. Haha!). Step 1: Two coats of Paper Mache, totally dry. 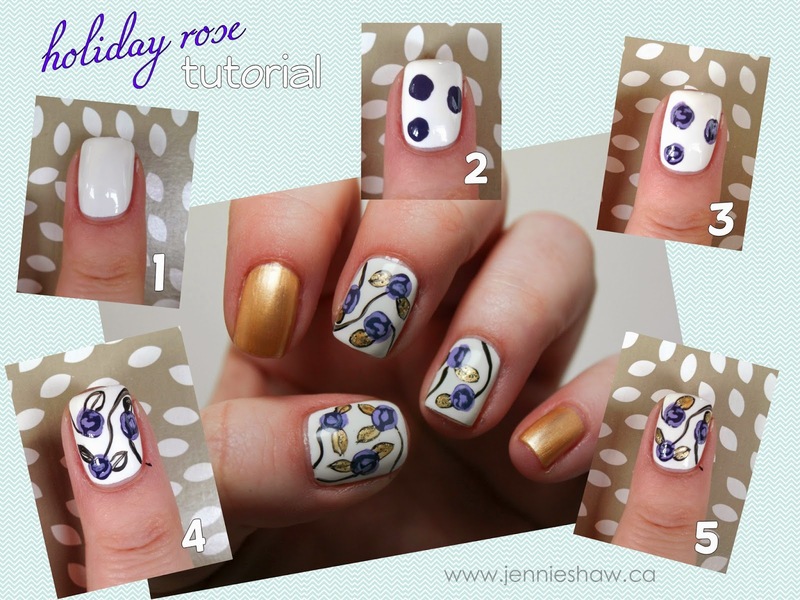 Step 3: With a thin nail art brush, make a u-shaped line in the centre with Tart-y For The Party, and then add a few more curved lines for petals. Step 4: With Black Stripe Rite, add the stems and leaf outlines. Step 5: With the same thin nail art brush as in Step 3, fill in the leaves with Rollin' in Cashmere, followed by De-Light. One coat of top coat seals it all in. Yay for fun, sparkly, untraditional holiday manicures! Haha! And, for a small, non-nail-related plug, thanks to your votes in the semi-final rounds, I've somehow made it into the FINALS for Karen's World Blog Awards, for the Pee-In-Your-Pants Funny Blog!! With a name like that, how can I NOT want to win, right? So if you could, I'd really appreciate your vote (possibly for a second time)! Click here for a post that lists what I think are my most recent, funniest posts. If you agree that I'm hilarious (haha) then I'd LOVE if you'd vote for me! Okay, so I'll love you even if you don't vote, but still, please do it. Haha! 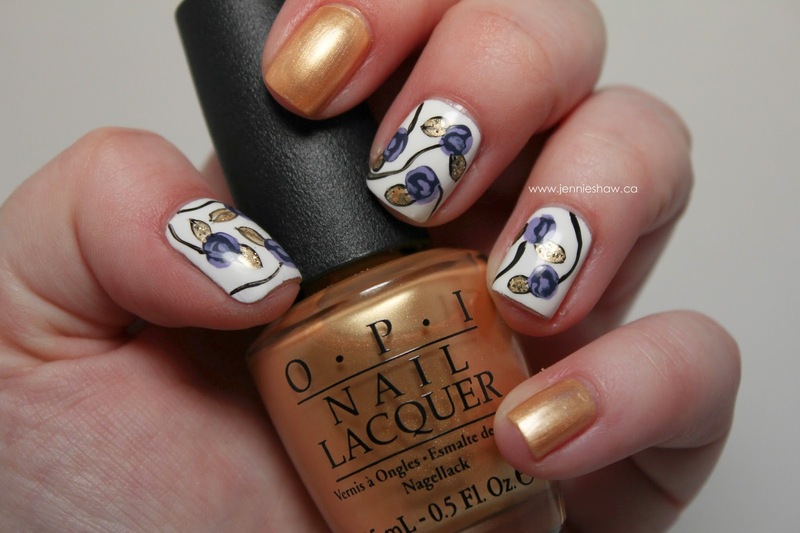 And don't forget to link up your manis for this week! I'm excited for a month's worth of holiday manis! YAY FOR HOLIDAY MANIS! I am SO impressed with this sweet friend!! I'd really like to recreate this at some point--at which point i'll totes give you all the credit! Loving the colors you used so much! loving them. 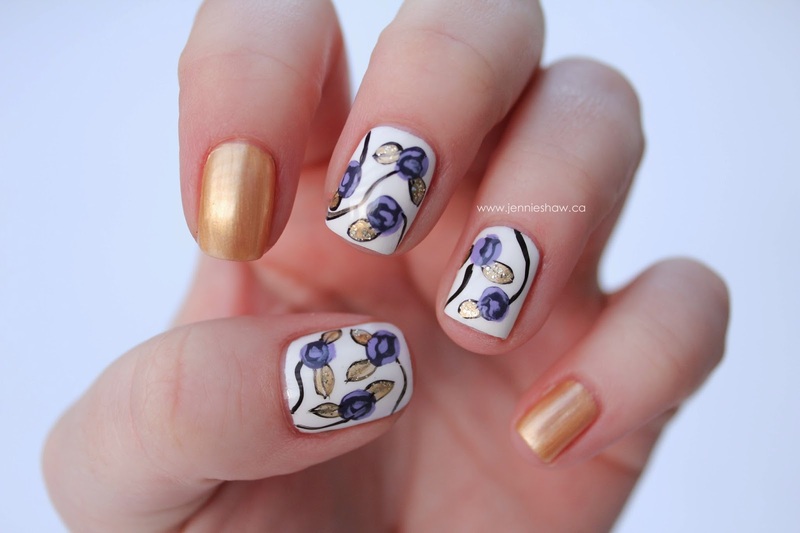 Your sure know how to rock the nail art. You make it look so easy. Maybe I'll try that sometime. I bet it won't look that nice though.